Snakes can be frightening, but only a handful are dangerous in Texas. ﻿﻿﻿﻿﻿Somewhere in the woods, a small coil of reddish-tan scales shifts, snuggling up closer to a fallen oak branch that stretches through the leaf litter. A pale red tongue flicks out, testing the air. The copperhead waits patiently for a mouse or a frog to wander close enough to become its next meal. Completely silent and able to remain essentially motionless, the little reptile blends perfectly into the mosaic of leaves on the woodland floor. Nearby, another copperhead hides under a tarp in a pile of junk. This little snake might have overwintered there, in the lee of a shed, or perhaps it had recently wandered in to eat a mouse. In any case, this particular copperhead is about to change Johnny Kratky’s life. It is Kratky’s tarp, and today is the day he has decided to clear out the junk. After pulling the tarp off, he reaches down for the first piece of debris and his finger is hit with a sting “like a red wasp.” Kratky sees the copperhead, and his wife drives him to the hospital, 45 minutes away in Fort Worth. Thankfully, he’s almost certain to survive the bite. Copperhead venom is less potent than that of other species, and these small snakes have short fangs that can inject only a relatively small dose. Less than 1 percent of those bitten will die from a copperhead bite. In fact, death from any venomous snakebite is quite rare; the state reported from zero to two deaths per year from snakebite between 1997 and 2005. Fewer people died from snakebite during this time than from lightning strikes. Snake venom was not designed as a defense against humans but rather as a service to help acquire a meal. The copperhead lying in wait in the woods uses its venom to disable and kill prey that might otherwise get away. The mouse bitten by a copperhead may scramble a short distance before dying, but the snake can easily track it down and eat it. Snake venom is made up of proteins, some of which begin the process of digestion by breaking down the animal’s tissues even before the prey is swallowed. The combination of venom glands and hollow fangs for injecting venom make up an elaborate hunting arsenal for the snake. Aiding this hunting arsenal is the “pit organ” located between the eye and nostril of copperheads, cottonmouths and rattlesnakes. These membrane-covered depressions in the snake’s face are sensitive to infrared energy and enable the snake to “see” warm objects in complete darkness — the snake’s version of an infrared scope. A rattlesnake waiting to ambush prey on a moonless night can detect a wood rat making its way along a trail and accurately aim a strike based on information from its pit organs. Snakes that have these remarkable organs are called pit vipers. As you’ve learned from the unlucky Johnny Kratky, copperheads are small pit vipers with a venom that’s less potent than that of other species. They reach a length of 20 to 36 inches. 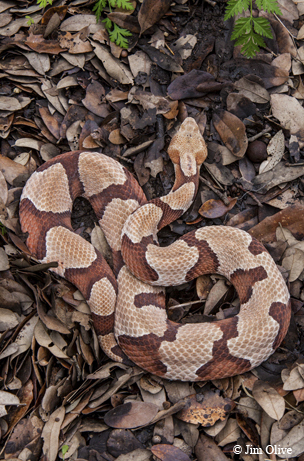 Copperheads are patterned with red or brown crossbands on a tan background and use their camouflage coloring to elude predators. Like other pit vipers, these snakes don’t lay eggs — females hold the eggs inside until birth. Active during spring and fall days and summer evenings, these slow movers feed on small animals and insects. They use their tail to lure prey to within striking distance. They are found throughout much of the state, more frequently in the eastern half. In the United States, probably the most feared pit vipers are rattlesnakes. There are eight species of rattlesnakes in Texas, ranging from the western pygmy rattlesnake, no more than about 18 inches long, to the western diamondback rattlesnake, which can grow to 5 or 6 feet in length (the record is slightly more than 7 feet). What they share in common is a tail tipped with a string of hollow rattles, which produce a buzzing or high-pitched rattling sound when vibrated by specialized muscles. A baby rattlesnake is born with a tail that has nothing more than a button composed of keratin, the same stuff that makes fingernails. As the snake grows, it periodically sheds its skin; with each shed it adds a new segment to the rattle, of which the button becomes the last part. The rattle segments are hollow and interlocking, so they rattle against each other when shaken. The rattled warning is one strategy the snakes use to avoid getting hurt. Their primary defense, though, is to avoid being seen. Once when I was hiking with friends, a footstep prompted the chick-chick-chick of a rattlesnake tail beginning to twitch but not fully rattling. We were walking through thin grass on rocky ground, and the snake was very difficult to see as it sat motionless. I froze. We looked around, located the snake (a western diamondback) and stepped away without incident. If we had not come quite so close, the snake would have remained silent and we never would have known it was there. A related species, the mottled rock rattlesnake, can sport different camouflage patterns to match the local rock and gravel habitat. At the edge of the Hill Country and near the Pecos River, where chalky gray limestone predominates, these little rattlesnakes are often light gray in color, with few markings. Farther west, where the rocks and mountains are darker and more volcanic, the snakes have more color, sometimes a reddish or an olive or buff color. This is a small species, with most rock rattlesnakes measuring less than 2 feet. Being hard to see is a definite advantage for them. 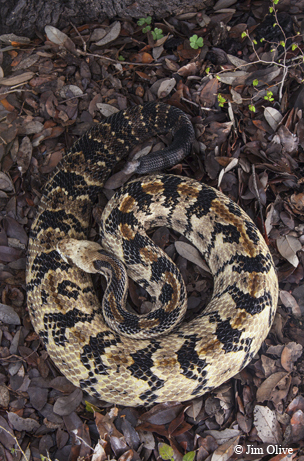 Among Texas rattlesnakes, the most feared is surely the western diamondback rattlesnake, perhaps because it also claims first place as “most dangerous.” The danger comes from its large size and correspondingly large venom glands and long fangs, as well as its temperament, which is often irritable. Although many of these snakes freeze or attempt to retreat when first confronted, if one feels truly threatened it can put up a furious defense. The forward part of the body rises off the ground and pulls back, ready to strike, as the rattle buzzes loudly and continuously. 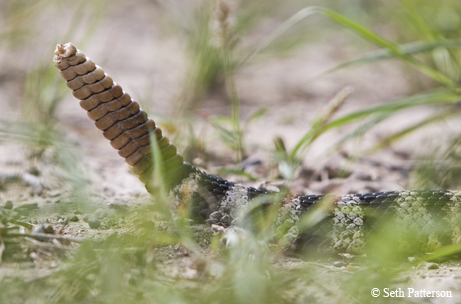 The snake tests the air with its black tongue, often extending and slowly waving it up and down before retracting it and sensing whatever smells are in the air. If its attacker comes close enough, the snake strikes forward, opening the mouth and rotating the fangs outward. The diamondback can strike and inject venom in a momentary blur and return to striking position almost too fast for the human eye to see. Texas has one rattlesnake that is listed as threatened. The timber rattlesnake (also known as the canebrake rattlesnake) is second only to the western diamondback in size, and lives in bottomland forests and upland woods near rivers and streams. The snake occurs only in certain localities across the eastern third of the state, in parts of the Cross Timbers of North Texas and in some of the mixed pine and hardwood forests in the southeastern region of the state. The timber rattlesnake spends much of its time quietly coiled alongside fallen logs or tree stumps, waiting for a squirrel or rat to come within striking range. Its yellowish or gray-brown body is broken up by a series of dark chevrons or irregular bands, with a vague reddish stripe running down most of its length. The tail is a deep, velvety black. Hikers or hunters have been known to step within inches of one of these snakes without triggering the slightest rattle, as the big reptile sizes up the threat and hopes to avoid being spotted. 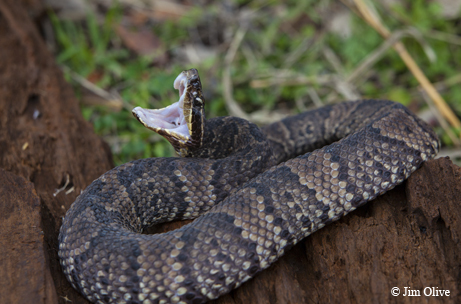 At some point, if the threat comes too close or the danger seems too great, timber rattlesnakes sound the rattle and can deliver a very serious bite. Since the snake is uncommon and often lives far from humans, bites from this species are rare. Another Texas pit viper that is greatly feared and reviled by some anglers and boaters is the western cottonmouth. Also commonly called “water moccasin,” this dark and fairly chunky snake is a close relative of the copperhead. Countless stories have been passed around about cottonmouths chasing people down boat docks or dropping into boats from overhanging trees. These snakes do make their home around water, and may climb into low branches at the edges of rivers or lakes. When disturbed, they quickly drop into the water and swim away. Adult western cottonmouth snakes average 2 to 3 feet in length, with some reaching greater lengths. 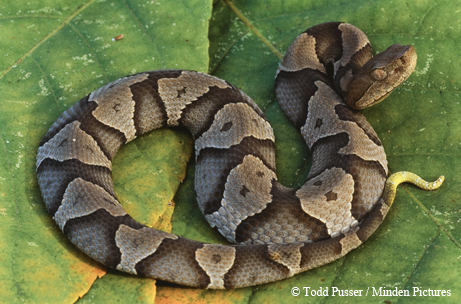 They are born with a sandy reddish or brown pattern of wavy crossbands alternating between lighter and darker colors, suggesting the color and pattern of the copperhead. As the snakes grow, the pattern darkens and may become all but invisible. Cottonmouths share a slight resemblance to our harmless water snakes, which are rather heavy-bodied and come in patterns of dark brown or green. Many a “cottonmouth” killed along a lake or pond turns out to be a nonvenomous water snake. Cottonmouths have an extremely varied diet. 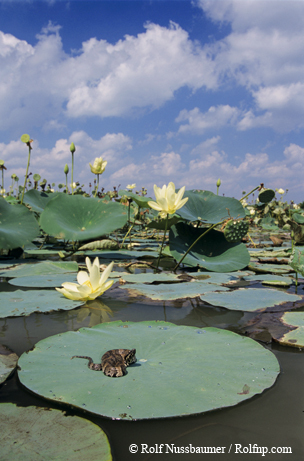 They eat frogs, salamanders, fish, other snakes and small mammals, and they may ambush birds that come to the water’s edge to drink. Most of the fish taken are small, injured or trapped in drying pools, so the cottonmouth is not a real threat to game fish. Researchers tested cotton-mouths’ alleged aggressiveness by stepping (with a protective boot) on or near cottonmouths, or grasping them with a set of tongs outfitted with a shirt sleeve and glove resembling a human arm and hand. They found that, for the most part, cottonmouths sit still or attempt to get away. They also may open their mouth in a threat display, showing the pale whitish tissues that give them the name “cottonmouth.” Only a minority of the snakes tried to bite, even when picked up by the simulated hand. Still, be cautious: Cottonmouth venom is worse than that of the copperhead and can cause considerable tissue destruction. 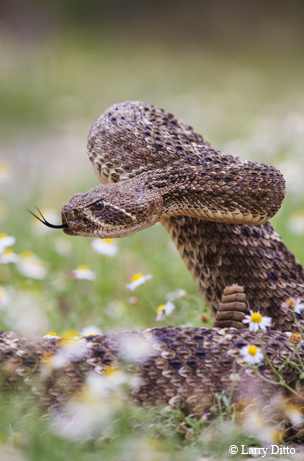 All but one of Texas’ venomous snakes is a rattlesnake, copper-head or cottonmouth. The one exception is a small and secretive reptile that is distantly related to the cobra — the coral snake. Most are no more than 2.5 feet long, with smooth, polished scales brightly ringed with black, yellow and red. The snake’s head is barely wider than its neck; this slender little serpent spends most of its time in leaf litter or burrowing through soil in search of lizards and snakes to eat. Coral snakes have short fangs that are fixed in place as opposed to the pit viper’s longer fangs (which fold against the roof of the mouth when not in use). Coral snakes are shy and nervous. They react to being found by attempting to escape, thrashing around and pushing against the attacker if grabbed. 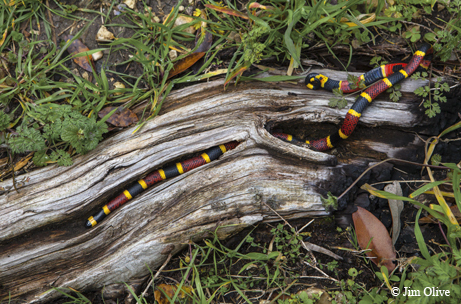 A coral snake may even coil its tail above its body and wave it around, while hiding its head. But make no mistake, this snake is capable of biting and delivering venom if touched or handled. Coral snake venom is primarily neurotoxic, meaning it can impair the transmission of nerve impulses that are essential for moving about and for bodily functions. Another snake, this one harmless, has a similar color pattern of red, yellow and black rings. Milk snakes have fairly broad red rings or saddles with fairly narrow black and yellow (or cream-colored) rings. Additionally, in the milk snake, the red and yellow rings are separated by black, while the coral snake’s red rings are bordered by yellow ones. After Johnny Kratky was rushed to help, he was given antivenin and spent several days in the hospital. When his ordeal was over, he had a $300,000 hospital bill. Peyton Hood was not so lucky. On Aug. 10, 2010, a western diamondback rattlesnake bit the almost-2-year-old on the ankle. She died five hours later after an emergency flight to a children’s hospital in Fort Worth. Peyton’s aunt, Tammy Reece, started Peyton’s Project to raise rattlesnake awareness about not only the danger but also medical advancements based on venom. The website contains rattlesnake information and ways to volunteer and donate. Visit www.peytonsproject.org for more information. 1. Remain calm and still. 3. Try to remember the shape and color of the snake to aid in identification and treatment. If you cannot get treatment right away, perform simple first aid such as washing the bite and applying a clean dressing. Keep the bite lower than your heart.